The custom-built Peugeot Premier is setting the standard for economical wheelchair accessible taxis across the UK. Exclusive to Cab Direct, Premier combines stylish good looks with affordability and superb fuel efficiency, making it a firm favourite with economy minded cabbies and company owners alike. Family run business A-line Taxis – which has been operating in Dorchester for a whopping 35 years – recently took delivery of two new Premiers. Co-owner Charlotte White spoke to Cab Direct. 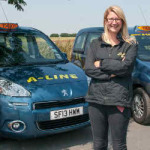 “My husband Steve and I took over A-line Taxis from my late father-in-law seven years ago. Particularly handy for cabbies, Premier’s unique FlatFold™ ramp can stow flat to the vehicles floor when not in use, allowing you to take advantage of full original rear seating and the huge boot space. Offering a five seat cab one minute and full wheelchair access the next, Premier has been specially adapted to give you the flexibility to cater for every fare. Click here to watch the video. Based on the stylish Peugeot Partner, Premier is powered by Peugeot’s economical Euro 5 HDi 92 diesel engine, helping make this one of the most reliable and cost effective taxis on the market today. With miles per gallon of up to 58.9 on the combined cycle, Premier helps keep fuel costs down. Combine this with Premier’s surprisingly low price tag and you’re sure to be impressed. Charlotte cadds: “I really can’t fault the Premier. It looks the part and everyone at A-line has been really impressed with it.